Racin’ Today » Late Bump Gives Harvick The Cup Win In N.H.
Late Bump Gives Harvick The Cup Win In N.H.
Kevin Harvick tracked down Kyle Busch over the final 20 laps, bumped Busch out of the way for the lead with seven laps to go and went on to win Sunday’s Foxwoods Resort Casino 301 Monster Energy NASCAR Cup Series race at New Hampshire Motor Speedway. The victory was the series-leading sixth of the season for the Stewart-Haas Racing driver. Joe Gibbs Racing’s Busch, a five-time winner this season and the series points leader, finished second – 1.8 seconds back. Aric Almirola of Stewart-Haas finished third. Martin Truex Jr., a four-time winner in 2018, finished fourth while Chase Elliott of Hendrick Motorsports was fifth. The race was supposed to start at 1 .m. but rain made that impossible. At 4:24, the green flag dropped and pole-sitter Kurt Busch, driving the No. 41 Ford of Stewart-Haas Racing, led the field to the start/finish line. Kurt Busch, looking to win for the first time in 54 races, led the first 37 laps but lost ti when he pitted for the series mandated competition caution. Taking over the lead was Ricky Stenhouse Jr. of Roush Fenway Racing. Stenhouse led 11 laps but lost it to Truex, who went unchallenged en route to winning the first 75-lap stage. Truex had a clean stop between stages and began the second stage P1. Elliott, who has eight runner-up finishes in his Cup career, moved past Truex to take the lead on Lap 132 and give Chevrolet a rare appearance at the front of a race field. Elliott led the next 19 laps and held off Kurt Busch to get his first stage victory – and Chevy’s third – of the season. Kurt Busch edged Elliott coming out of the pits during the caution between stages, and had the lead once again. Busch spent the next 55 laps in control, but with 95 laps to go, Almirola, moved to Busch’s rear bumper. On lap 212, Almirola moved past his Stewart-Haas teammate and into the lead. With 74 laps to go, the leaders headed to the pits for the final time under green. On his out-lap, Almirola was passed by teammate Harvick. But with 69 to go, Almirola came back and recaptured the lead. Leading by over a second with 45 laps to go, the caution flag waved. Kyle Busch jumped two spots with a quick pit stop and took his first lead of the day. But here came Harvick. 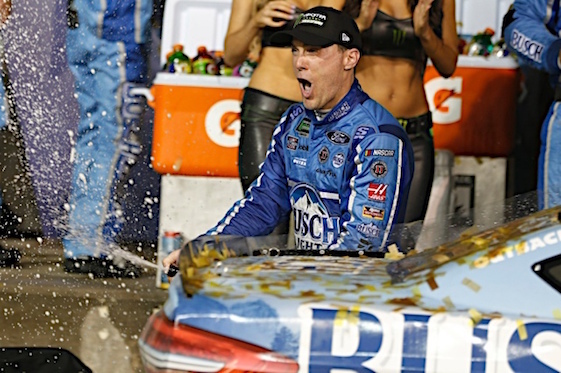 That set up the final excitement and Harvick’s winning pass. 1. (14) Kevin Harvick, Ford, 301. 2. (3) Kyle Busch, Toyota, 301. 3. (13) Aric Almirola, Ford, 301. 4. (2) Martin Truex Jr., Toyota, 301. 5. (10) Chase Elliott, Chevrolet, 301. 6. (18) Ryan Newman, Chevrolet, 301. 7. (5) Ryan Blaney, Ford, 301. 8. (1) Kurt Busch, Ford, 301. 9. (19) Joey Logano, Ford, 301. 10. (21) Jimmie Johnson, Chevrolet, 301. 11. (8) Alex Bowman, Chevrolet, 301. 12. (20) Kyle Larson, Chevrolet, 301. 13. (4) Denny Hamlin, Toyota, 301. 14. (11) William Byron #, Chevrolet, 301. 15. (31) Matt Kenseth, Ford, 301. 16. (7) Erik Jones, Toyota, 301. 17. (12) Paul Menard, Ford, 301. 18. (22) Jamie McMurray, Chevrolet, 301. 19. (26) Kasey Kahne, Chevrolet, 301. 20. (24) Chris Buescher, Chevrolet, 300. 21. (17) Austin Dillon, Chevrolet, 300. 22. (9) Daniel Suarez, Toyota, 300. 23. (25) Ty Dillon, Chevrolet, 300. 24. (27) Bubba Wallace #, Chevrolet, 299. 25. (32) Ross Chastain(i), Chevrolet, 298. 26. (29) Michael McDowell, Ford, 298. 27. (33) Corey LaJoie, Chevrolet, 298. 28. (28) Matt DiBenedetto, Ford, 298. 29. (30) David Ragan, Ford, 298. 30. (23) Ricky Stenhouse Jr., Ford, 296. 31. (35) * Kyle Weatherman, Chevrolet, 294. 32. (6) Brad Keselowski, Ford, 293. 33. (37) Blake Jones, Toyota, 289. 34. (36) BJ McLeod(i), Chevrolet, 267. 35. (15) Clint Bowyer, Ford, Accident, 255. 36. (16) AJ Allmendinger, Chevrolet, Accident, 19. 37. (34) Landon Cassill, Chevrolet, Accident, 13. Average Speed of Race Winner: 110.49 mph. Time of Race: 02 Hrs, 52 Mins, 56 Secs. Margin of Victory: 1.877 Seconds. Caution Flags: 7 for 31 laps. Lap Leaders: Kurt Busch 1-37; R. Stenhouse Jr. 38-48; M. Truex Jr. 49-131; C. Elliott 132-154; Kurt Busch 155-211; A. Almirola 212-228; K. Harvick 229-232; A. Almirola 233-257; K. Harvick 258; Kyle Busch 259-294; K. Harvick 295-301. Leaders Summary (Driver, Times Lead, Laps Led): Kurt Busch 2 times for 94 laps; M. Truex Jr. 1 time for 83 laps; A. Almirola 2 times for 42 laps; Kyle Busch 1 time for 36 laps; C. Elliott 1 time for 23 laps; K. Harvick 3 times for 12 laps; R. Stenhouse Jr. 1 time for 11 laps.